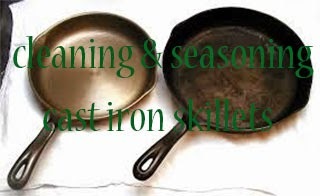 Cast iron skillets are great to have but cleaning them could be a pain. All these does and don'ts for cast iron skillets is enough to have your throw your hands in the air and forget them all together. With these simple instructions you can clean and care for your skillet without the headache and hassle that most instructions would normally put you through! 1. Clean the skillet immediately after use while it is still hot or warm. Avoid soaking the pan or leaving it in the sink, or it could rust. 2. Wash the skillet by hand using hot water and a sponge or stiff brush. Do not use the dishwasher, soap, or steel wool, as these could strip the pan's seasoning. 3. To remove stuck-on food, scrub the pan with a paste of coarse kosher salt and water. Food residue may also be loosened by boiling water in the pan. 4. Thoroughly towel dry the skillet or dry it on the stove over low heat. 5. Using a cloth or paper towel, apply a light coat of vegetable oil, coconut oil or melted shortening to the inside of the skillet. Buff to remove any excess. 6. Store the skillet in a dry place. Remove rust by rubbing it with half a raw potato and a bit of baking soda. It may be necessary to re-season the pan after cleaning. How do you normally clean your cast iron skillets? Has care for one deterred you from purchasing one? I haven't owned one in awhile. I think the cleaning and re-seasoning did deter me a bit but I do love them. Thanks for this! I have several from my grandmother, I need to do this! I usually use plastic tool for scrubbing my pans. Plastic tool couldn`t scratch the pan. The surface is clean and neat. I need to season mine pans. Thank you for sharing your article. Best regards!